A stop-motion that reappears along a river of time. Thomas Demand, Rain/Regen, (still), 2008. // Source: dhc-art.org. Certain art-viewing experiences stay with you over time. When they’re pleasant, they can remind you of how meaningful the act of looking can be. Recalling a work of art—like reliving any memory—strengthens its salience. It could be that a series of vital art experiences will one day form a tally of the particular arcs of my life. One work that I’ve continued to think about is Thomas Demand’s** Rain/Regen (2008). I saw it in 2010 in The Dissolve, the moving-image focused iteration of SITE Santa Fe’s biennial. It was my first visit to SITE and Santa Fe, on my first cross-country drive. We were moving from California to New York. Marking this life change with a road trip was wise. Those two weeks stand out in high relief. I remember stepping out of Santa Fe’s picturesque, sun-baked adobe environs into the cinematic black box of the ICA. Floating screens and scrims primed me for psychologically-loaded spaces. Teresa Hak Kyung Cha’s notion that video paralleled the cinema of the mind seemed present. Essentially, Demand makes stop-motion animations using paper constructions that are ever-increasing feats of production value. Rain/Regen is just what it sounds like—it’s an animated image of raindrops falling in a thin, frame-filling puddle. The fact that it’s constructed by hand, frame by frame, is astonishing. In this case, the paper might be bits of thin, clear plastic torn and stretched by hand. But like rain, all you see are streaks and a momentary splash upon impact. It’s gone in a split second. It happens fast, before your eye can catch up to it. It’s startlingly reminiscent of the overall peripheral sensation of rain. The perceptiveness of perception itself seems yet even more impressive. I know crediting this work with technical wow-factor sounds hollow. But the simplicity of the shot, indeed, the everydayness of the concept, paired with the ambition of animating it, forms a curious nexus. I was moved by many works in that show, but Rain has stuck with me. Even the physics of a seemingly trivial drop of water exceeds the abilities of the human eye. We grasp only its motion, implosion, and disappearance. *It’s been oddly reassuring that mentions of friends, colleagues, and acquaintances keep popping up in books I’m reading: Ted Purves in Tom Finklepearl’s What We Made, Marshall Trammel in Greg Sholette’s Dark Matter, and a familiar image by Hank Willis Thomas in Jeff Chang’s Who We Be. It’s probably attributable to two truths: the inevitability that a cohort would become the archivists and subjects of our eras, and, though I didn’t know it at the time, I was in the right places at the right times. **It’s safe to assume that mega-artists like Thomas Demand rely heavily on studio staff for producing artworks, so a more fitting attribution would actually be “Thomas Demand Studio.” Of course sole authorship flows more freely through the systems of capitalism and law, but it’s nice to imagine a day that we drop these pretenses. In my London art trip, I was intrigued by about two collection-based venues; both in Camden and both new to me. The current shows were interesting enough, but I am more intrigued by the spaces and the ambitious, cutting-edge contemporary art they will show. a museum is a production site, a site that not only presents and describes an existing context, but generates new contexts, a site where artists, curators, critics and other stakeholders can produce, share, discuss, act and interact, where visitors are co-producers, and where the machinery of exhibitions produces prototypes, experiences, catalysts for thought…. An artwork is a system that cannot be reduced only to an object or an index (certificat, instructions, etc.). It also includes the histories (material and conceptual), the trajectories (physical or virtual) and the narratives (past or to come) generated by the artwork: this is what this programme will research. Study is not an attempt to capture or seize but a methodology of encounter and the insistence on the provisional as both form and content within the process of research. Read more here (click on A House of Leaves. First Movement). Gerhard Richter, Fuji, 1996 Oil on alucobond. David Roberts Collection // Source: davidrobertsartfoundation.com. Small but stunning Richter on view in A House of Leaves as of two weeks ago; it’s an ever-unfolding exhibition so who knows what’s on now? While DRAF is housed in an industrial brick warehouse in an alley off of the high street, the Zabludowich Collection is sited in an imposing church in a residential street. Matthew Darbyshire, Showhome, 2012 // Source: zabludowiczcollection.com. The current exhibition by Matthew Darbyshire featured sets made of printed vinyl CG streetscapes. I was most interested in the Showhome installation, involving mass manufactured chairs and high-end interior design decorations. It was familiar yet preposterous and sad. There’s something interesting in packaging showrooms’ theatricality in art exhibit’s pretentions of perfect, timeless viewing experiences. The exhibition as a whole expressed some of the suffocation of consumer culture, and I couldn’t help but feel some of that coldness and repression as I left the show. This detail of The Tempest (~1862) by Peder Balke. It’s a seascape, maybe one of the most unlikely genres of painting I’d be attracted to. But the elegance, brushstrokes, simplicity and evocativeness is what gets me. Stephen Chambers’ gold leafed potato print, on view now at the Royal Academy of Arts in the Artist’s Laboratory. Two faces, carved with simple marks. Maybe a man and a woman. Despite the elemental form, I still read the faces as deeply empathetic with each other, united in the way that lifelong couples are. Potato prints are a basic form of printmaking, one that could be the first type of printmaking children experience. The idea of gold-leafing a potato print is so absurd it’s brilliant. The show features a 70-part screenprint mural, nice stuff, interesting timeless narrative vignettes. A theoretical device for communication. Nice pairing with Demand and Opie. Plus a daringly bright aqua wall. Go Tate! Richard Artschwager, Tower II, 1979 (center), with a photo by Thomas Demand (left) and Julian Opie’s You See An Office Building 4 (1996). Tate Liverpool. By chance, I stumbled into The Grange Prize exhibition at Canada House. It was a group exhibition featuring the work of four finalists for a major international, contemporary photo prize. I was most attracted to Jason Evans’ work; it was the most playful and mixed-media, using wall graphics, texts, objects, and loud colors. The combination unfolds in a way that I think asks the viewer to engage the experience in a more multi-sensory way. Here are some of his casual, snapshot-like photos. I think they work better en masse. Jason Evans. // Source: jasonevans.info. Jason Evans. Installation view. // Source: jasonevans.info. A gathering of friends on a beautiful July evening at sunset. Celebrating friendships and the blessed life I’ve enjoyed since moving to Oakland in 1994. I’m California-born and raised, but I haven’t really seen the “West until now. It’s stunning. My fears that the world is crisscrossed with interstates and civilized with Walmarts are not completely warranted. The drive from Las Vegas, N.V. to Santa Fe, N.M. showed me that much of the West is still wild; the dramatic red bluffs are nothing short of breathtaking. I snapped some pics, but they fall terribly short; you have to be there to experience sense of scale and grandeur. M and I played tourist in Santa Fe, seeing sites in the historic downtown (and crashing a church festival for some G.O.A.T. carne asada tacos). Santa Fe is gorgeous, scenic, historic, and bursting with culture. Tons of visual art, Native American art (so many images from art history classes come to life: black-on-black pots by Maria Martinez, squash blossom turquoise-and-silver-necklaces), Spanish colonial architecture, and fun stuff like Native American papercuts, paper machê crafts, and—yes, ya’ll—Southwestern regional woodcut artists (and why not?). Our brief visit was far too short; I was struck with the feeling that I could easily spend more time there. So I’m putting it out there, Universe: Have Me Back To Santa Fe. A strong show of videos made and manipulated by 30 contemporary international artists, including biennial-circuit usual suspects (Kara Walker, Paul Chan, William Kentridge) and more. Thomas Demand’s video of raindrops hitting a glossy concrete floor is another impressive feat of stop-motion paper animation, very sweet in its mundanity. Robin Rhode’s short video in black and white, largely about inversions, race and light, is another favorite of mine. I just didn’t have time to see the whole show (which would have taken days), but many of my impressions were influenced by the forceful exhibition design, for better and worse. The first room successfully featured scrims dividing roughly equal-sized screening rooms. * But the exhibition design of later rooms overpowered the ther works. The light and audio seepage in the cyclorama-like oval were missteps, as was the integration of solo viewing booths into a bench in theater with one dominant screen. The experience was unpleasantly akin to screen-in-screen browsing; I could focus on neither screen in front of me. I think this kind of overwhelming media experience is fine for solo shows, but in a group show, it shafts the artists who’ve drawn short straws. It’s a strong curatorial statement to feature 30 videos, and it would be a challenge to any institution, but you have to wonder what the architects were thinking. SITE Santa Fe had some flaws but it was energetic, now, and smart. Who Shot Rock & Roll is a large, highly enjoyable exhibition of photographs of rock and pop musicians from the last half-century. The celebrity, glamor, pop culture, and sensationalism appeals. Those who dig deeper will find insightful captions about the technique, ingenuity and chance that went into the making of the famous photographs. Having spent my fair share of adolescence studying trippy album covers, I also appreciated the didactic texts and displays about the surreal, pre-Photoshop images by artist-designer Storm Thorgersen and Jean-Paul Goude (of superhuman Grace Jones, natch). In our improvised gander at Nashville, we stumbled into a beautiful, huge, working letterpress shop and storefront. Downtown Nashville is anchored by a shiny new country music museum, the usual Hard Rock Cafe and BB King blues club, so I wasn’t expecting to see such historic, indie culture. But there it was on touristy Broadway, with its fittingly nostalgic relief prints, cheeky and upbeat typography, and endearingly worn sign type. While we were browsing the wares, I overheard the proprietor mentioning CCA and the SF Center for the Book! That the two most interesting contemporary art exhibits on my eastern migration (the SITE Santa Fe biennial and Rock & Roll) were curated by New York curators/institutions was not a good sign for the idea of a de-centralized contemporary art world. So it was a pleasant surprise to come across SF Bay Area artists Binh Danh and Primitivo Suarez in, of all places, Roanoke, VA. Danh (whose solo show opens at Mills College Art Museum August 21) mentioned that he was doing a residency, but I forgot until I saw his artist’s talk advertised in the local paper. Suarez has a large installation on view at the Taubman Museum of Art, a swooping steel-and-glass trifle that contrasts sharply with the colonial railroad town. Perhaps M was right—this is a tourist trap. Or maybe I’m right—a miniature village hand-crafted by two brothers at mid-century, which sprawls over several thousand square feet, loaded with electric trains, lights, fountains and a waterfall is art. Or at least it is artistic production worth a visit, because it says something about tinkerers, hobbyists, miniature culture, maker culture, and the urge to create and reflect the world you see. In either case it is odd and wonderfully preserved, though you get the sense that it is anachronistic enough that its future is in jeopardy, and you feel lucky to have seen it. ·Coconino National Forest, A.Z. : Friendly park hosts, beautiful pine grove at elevation that brought the oven-like southwestern heat to nice cool temps. Absolutely pristine and sparsely populated in a way that you’d never see in California. ·Ute Lake State Park, N.M.: Your basic horseshoe campground in a great plain. Curious and friendly park hosts and RV campers. Apparently we visited during monsoon season; hot, humid, windy. 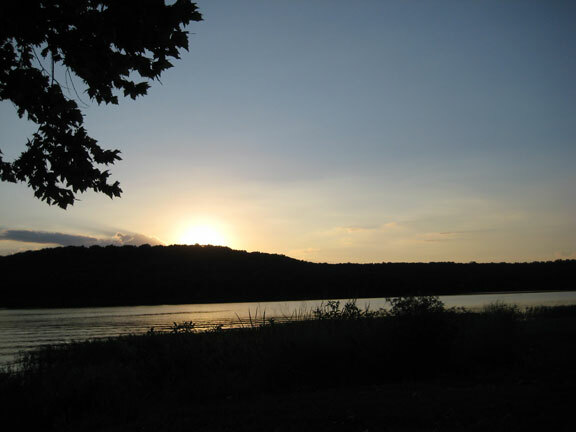 ·Foss Lake State Park, western O.K., and Brushy Lake State Park, eastern O.K. Oklahoman reservoirs tricked out for RV camping and water sports, a study in contrasts. The former filled with empties-throwing, nappies-leaving, jet-skiing yahoos and not a ranger in sight; the latter, alcohol prohibited, but quiet, scenic, clean and staffed by a generous host. ·Edgar Evins State Park, T.N. : A unique campground situated on a steep hillside. Sites were wood-plank and I-beam pads jutting out from the road. The reservoir was clean and calm, great for swimming. Fireflies abounded. ·Hungry Mother State Park, V.A. : Hands down the best park: natural lake with diving boards, lots of swimming, lots to explore, cute discovery center. The only downside was that the sites were too close together, but the neighbors in our RV subdivision were nice enough. ·Fort Frederick, M.D. Self-pay, no water, no bathrooms, lots of rules, and a train passing nearby. The fort itself had a neat history (at one time owned by a formed slave) but the campsites weren’t nothing special.